We offer high quality, durable and functional puppet theatres and furniture designed to stimulate imagination when playing with puppets. These puppet theatres and accessories are sure to add an element of stage production to any play area. Selection includes Table Top Theatres, Space Saver and Imagination Panels, Puppet Theatres and Dress Up Centers. Puppet Stands, and replacement curtains also available. All products meet all US and Canadian Standards with non-toxic finishes. Add Play Area flooring to provide comfortable seating for the audience - go to Play area Products - Floor Mats, Children's Carpets and Floor Cushions. 1560JC KYDZ SUITE® PUPPET THEATRE TOPPER -28½" 36" 4"
Encourage imagination and socialization! 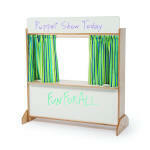 This upper divider panel doubles as a puppet theater, store or window and it’s accessible on both sides. Curtains included. Connect on top of a KYDZ Suite configuration, or stand alone with lower panel, hubs and stabilizer wings (sold separately). Connects to other KYDZ Suite® Minimal assembly GREENGUARD Children & Schools indoor air quality certified. Made in the USA! Click here for more information on KYDZ SUITE products. 1562JCA KYDZ SUITE® PUPPET THEATRE A-Height 64" 41½" 22"
1562JCE KYDZ SUITE® PUPPET THEATRE E-Height 58" 41½" 20"
1562JCT KYDZ SUITE® PUPPET THEATRE T-Height 53" 41½" 18½"
This versatile unit can be used as a puppet stage or a store. 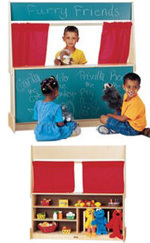 Features a bright curtain, shelf space included and chalkboard panels. 32" X 6" X 46"H.
A brightly colored stage with curtains for imaginative puppet shows. Write and wipe marker board on front for announcements. Sturdy birch laminate construction. 34" high x 30 3/4" wide by 12". 16 lbs. Easy to assemble, ships UPS Ground. GreenGuard Certified. Made in the USA. Lifetime Warranty. A small play screen for smaller places. Minimal assembly. 34” wide x 47” high. Available with Chalkboard, Flannel or Write-n-wipe. Lifetime warranty, made in the US and Greenguard certified. A stage, a store, a drive-up window! Available with Chalkboard, Write-n-wipe or Flannel board. Curtain rods included. Stationary. 49" wide x 15" deep x 49" high. Customer assembly required. Order 0723JC for Red Curtains - not included. Lifetime warranty, made in the US and Greenguard certified. 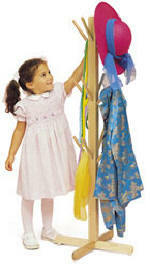 Twelve strong pegs make it easy to organize dress-up clothes. 48" High. Ready to Assemble. Save valuable space while organizing costumes and pretend-play accessories. 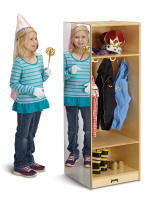 This compact dress-up locker contains four double coat hooks for hanging costumes and jackets. Top and bottom shelves provide storage for boots, shoes, hats, and smaller accessories. The locker features an acrylic mirror on one side of the unit, making it easy for kids to make sure they have everything in place before entertaining their audience. Lifetime warranty, made in the US and Greenguard certified. 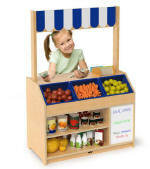 Create a dress up play area with this portable cart. Permanently mounted unbreakable mirror, five double coat hooks, caster mounted. Top and bottom shelves are 22½" wide x 13" deep x 2½" high. 24"W X 15"D X 36"H.
Delight little stars with a dress up island scaled to their size. Eight double coat hooks. Full length acrylic mirror - stationary. 36"W X 15"D X 29"H.
Designed for storage and stability. Distortion free acrylic mirror, ten double coat hooks, caster mounted. Top and bottom shelves are 47” wide x 13” deep x 2¼” high. Overall 48”W X 15”D X 35”H. Keep costumes organized and handy with this mobile unit. 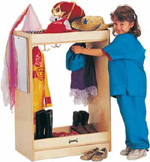 Designed to hold costumes, hats, and many other pretend play accessories for even the most imaginative children! The included six clear Tubs and one clear Jumbo Tote with lid make it easy to store smaller accessories. Eight double coat hooks mean plenty of room for hanging a wide variety of costumes and dress-up items. Kids can make sure they are dressed for the part with the side-mounted, distortion-free acrylic mirror. 37.5" High x 48" Wide x 23" Deep. Greenguard Certified, Lifetime warranty and made in the USA. Features a full-length (kid's size) acrylic mirror for dress-up play. 18" wide x 50" high x 18" deep. Wheel out the imagination! 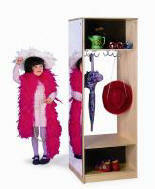 Holds lots of costumes for children to dress-up and pose in front of the mirrors on either side. Constructed from beautiful, durable birch laminate in natural UV finish. Includes casters for handy mobility. Made in USA. GreenGuard Certified. Lifetime Warranty. 48in. × 36in. × 48in. Our stylish and sturdy dress up center will inspire toddlers to reenact the events in their daily lives through entertaining open-ended play. Features two safe hooks to hold costumes or props, a wide shelf or seat with ample storage compartment below, a safe, shatterproof acrylic mirror mounted on the side of the cabinet, and a wide, sturdy base to prevent tipping. Constructed in beautiful, durable birch plywood in safe, non-toxic natural UV finish that won't yellow and withstands rigorous use by children. Dimensions: 14.75"L x 15"W x 36"H, weighs 35 lbs. Ships ready to assemble by UPS or FedEx Ground. Made in the USA. GreenGuard™ Gold certified. Lifetime Warranty. The ultimate dress up center! This sturdy double-sided dress up cabinet features a contoured design that widens at the base for stability and incorporates thoughtful use of storage throughout that will inspire hours of imaginative play. Four stacked open storage shelves hold four clear plastic trays [included]. A seating platform enables children to sit and change shoes that can be stored underneath in the divided compartment. Overhead is an open storage shelf for hats or other items, and eight safe double prong coat hooks [four on each side] provide plenty of space to hang an assortment of garments. A full length mirror in safe, shatterproof acrylic is mounted on one end, and the cabinet is mounted on six heavy duty locking casters for handy mobility. Constructed in beautiful, durable birch plywood in safe, non-toxic natural UV finish that won't fade and withstands rigorous use by children. Dimensions: 23.5"D x 48"W x 49.25"H, weighs 115 lbs. Easy assembly. Ships UPS or FedEx Ground. Made in USA. GreenGuard™ Gold certified. Lifetime Warranty. 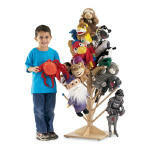 The 32 durable "branches" hold, organize and visually display all those puppets in one perfect place. Constructed in beautiful, durable solid maple in safe, non-toxic natural UV finish that won't yellow or fade and withstands rigorous use by children. Ships RTA, easy to assemble. Made in the USA. GreenGuard™ Gold certified. Lifetime Warranty. Maple Trunk has sixteen branches for puppets or hats. Assembly required. 18"W X 18"D X 49"H.
All Pricing in US and Canadian Dollars as specified - Prices Subject to Change. Consumers may purchase products. Allow 3-4 weeks for delivery. Products are Shipped Freight or UPS/Fedex Prepaid.